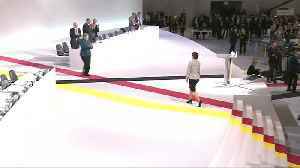 German conservative leader Annegret Kramp-Karrenbauer said divisions in the ruling coalition about planned military spending were undermining Germany's credibility worldwide. German conservative leader Annegret Kramp-Karrenbauer said on Wednesday that suspending Hungary's Fidesz party from the EU's centre-right political group would be a good option until trust was rebuilt..
▶ Videos for "Annegret Kramp Karrenbauer"
British business is in a frantic last-bid effort to get itself onto a protective footing for a possible 'no-deal' hard Brexit on March 29th. And, as Laura Frykberg reports, trading partners in the EU.. Raw Politics: Is Annegret Kramp-Karrenbauer Angela Merkel 2.0? 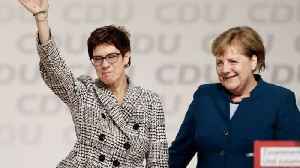 Is the new leader of the Christian Democratic Union (CDU), Annegret Kramp-Karrenbauer (AKK), a 'mini-Merkel' or an Angela Merkel clone? 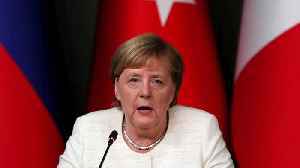 According to Reuters, the new leader of Germany’s Christian Democrats outlined plans to change the party’s migrant policies before next year’s European election. 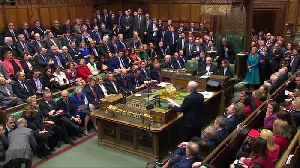 The conservative party elected.. 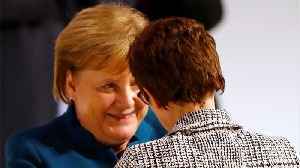 According to Reuters, Annegret Kramp-Karrenbauer, the new leader of Chancellor Angela Merkel’s Christian Democrats, sought to bind the party together after a divisive leadership battle by promoting a..
Reuters reports that Annegret Kramp-Karrenbauer sought to bind her party together by promoting a rival’s ally to a key post on Saturday. This after a divisive leadership battle. Kramp-Karrenbauer is..
Annegret Kramp-Karrenbauer is a former state prime minister and is seen as Merkel's hand-picked successor. 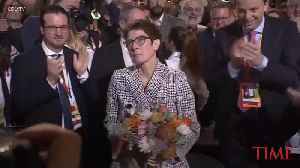 Germany&apos;s Christian Democrats elected Annegret Kramp-Karrenbauer on Friday to replace Angela Merkel as party leader, a decision that moves her into pole position to succeed Europe&apos;s..
Annegret Kramp-Karrenbauer has been elected leader of Germany's Christian Democratic Union party. Kramp-Karrenbauer was favored to lead the CDU when Angela Merkel announced her retirement in October..
Germany's Christian Democrats elected Annegret Kramp-Karrenbauer on Friday to replace Angela Merkel as party leader, a decision that moves her into pole position to succeed Europe's most influential..
German conservatives on Friday elected an ally of Chancellor Angela Merkel to become her party’s new leader — giving her the challenge of opening a new chapter and improving the party’s electoral..
Germany's ruling Christian Democratic Union party elected Annegret Kramp-Karrenbauer to succeed Chancellor Angela Merkel as its new leader on Friday. 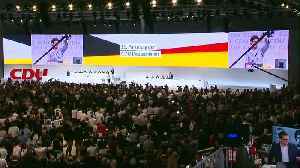 The 56-year-old general secretary of the CDU.. According to Reuters, German conservative Annegret Kramp Karrenbauer won most support in a vote on Friday to choose a successor for Angela Merkel as leader of their Christian Democrats. However, a.. 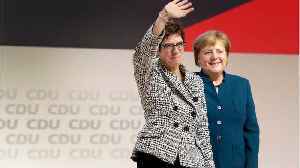 According to Reuters, Germany’s Christian Democrats elected Annegret Kramp-Karrenbauer on Friday to replace Angela Merkel as party leader, a decision that moves her into pole position to succeed.. It seems that President Trump found a replacement for Nikki Haley as UN Ambassador. Several news outlets have suggested he has asked Heather Nauert to replace Haley. Nauert is a State Department.. It seems that President Trump found a replacement for Nikki Haley as UN Ambassador. Numerous news reports have suggested he has asked Heather Nauert to replace Haley. Nauert isa State Department..
France's industrial output shows a surprise boost in October, but similar data from Germany shows an unexpected fall, adding to signs that a cooling trend will continue in the fourth quarter. As David..
Who is Annegret Kramp-Karrenbauer? Could she be the new Merkel? 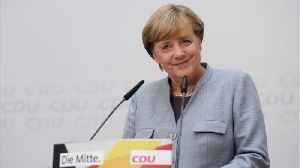 According to Reuters, Chancellor Angela Merkel on Monday declined to back any of the candidates seeking to replace her as party leader of the center-right Christian Democrats (CDU) at a convention in..
German Chancellor Angela Merkel plans to step down from her position as leader of the Christian Democratic Union party, but wants to serve as chancellor unti 2021 according to Reuters. Veuer's Sam.. 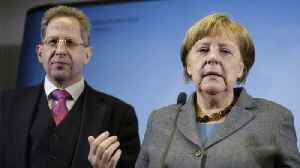 According to a report by Reuters, on Friday, German Chancellor Angela Merkel said that her coalition government would survive debate surrounding the country's domestic intelligence chief following.. 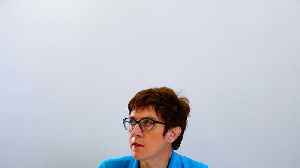 The new leader of Germany's ruling Christian Democrats, Annegret Kramp-Karrenbauer, unveiled plans for a tightening of immigration rules, part of a move to distance the party under her leadership from.. 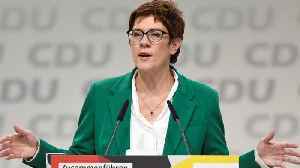 The new leader of Germany's ruling Christian Democrats, Annegret Kramp-Karrenbauer, bungled her welcome to party members meeting to discuss immigration policy by calling them "Social Democrats" - the.. 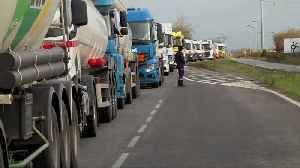 The leader of Germany's ruling Christian Democrats, Annegret Kramp-Karrenbauer, criticised U.S. President Donald Trump's administration on Thursday for making it "more difficult to work together in the..
German conservative leader Annegret Kramp-Karrenbauer on Monday accused environmental organisations of mounting "crusades" against diesel vehicles and said that driving bans threaten hundreds of..
Annegret Kramp-Karrenbauer, the new leader of Germany's Christian Democrats, heads into 2019 more popular than Chancellor Angela Merkel, who supported her rise to the top of their party, an opinion..
Annegret Kramp-Karrenbauer, the new leader of Chancellor Angela Merkel's Christian Democrats, sought to bind the party together after a divisive leadership battle by promoting a rival's ally to a key..
By Paul Carrel and Madeline Chambers HAMBURG (Reuters) - Germany's Christian Democrats elected Annegret Kramp-Karrenbauer on Friday to replace Angela Merkel as party leader, a decision that moves her.. The frontrunners are Annegret Kramp-Karrenbauer, a Merkel protege seen as the continuity candidate, and Friedrich Merz, a Merkel rival who has questioned the constitutional guarantee of asylum to all..
By Andreas Rinke and Paul Carrel BERLIN (Reuters) - The European Union and the United States should consider banning from their ports Russian ships originating from the Sea of Azov after Russia..
Annegret Kramp-Karrenbauer, leading polls to succeed Angela Merkel as head of Germany's Christian Democrats, said she would consider legislation to ensure better representation of women in parliament,.. 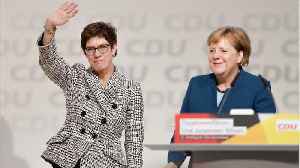 Some 35 percent of members of the two conservative parties in Germany's ruling coalition favour Annegret Kramp-Karrenbauer, a protege of Chancellor Angela Merkel, to replace her as leader of the.. Pitching to succeed Angela Merkel as Christian Democrat (CDU) leader, Annegret Kramp-Karrenbauer promised on Wednesday a new chapter for Germany in which "people feel at home here" after a period of..
German Chancellor Angela Merkel said on Monday she would not seek re-election as party chairwoman and that her fourth term as chancellor would be her last, heralding the end of a 13-year era in which..
German Chancellor Angela Merkel's ruling coalition faces its second test in as many weeks on Sunday when voters go to the polls in the western state of Hesse for a regional election that could torpedo..
German Chancellor Angela Merkel is seeking talks with some EU member states on migrant policy before a leaders summit at the end of the month, a government spokesman said, in a last-ditch bid to avert..
Germanys second biggest party said Sunday its members have in their high-stakes referendum approved a plan to join Chancellor Angela Merkels coalition, clearing the last hurdle in the way of the..
BERLIN (Reuters) - German Chancellor Angela Merkel put forward close ally Annegret Kramp-Karrenbauer on Monday to take over as secretary general of her Christian Democrats (CDU), heeding calls from..
Germanys Senate on Friday asked the constitutional court to ban state funding for the far-right National Democratic Party (NPD), the countrys longest-established neo-Nazi group, responding to concerns..
Election appearances which put at risk domestic peace in our country must be banned," said State Premier Annegret Kramp-Karrenbauer in a statement.